These are great, fun and so easy and SUPER inexpensive to do your self. You will fall in love with how easy it is and how adorable. Plus once again, who doesn't love something personalized. It SCREAMS thoughtful and adorable. 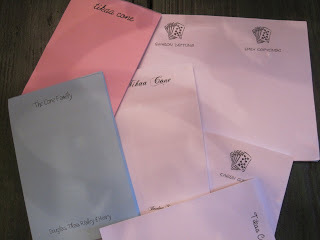 I've been doing these notepads for friends, children's party favors, special treats, etc.... for YEARS and YEARS. I think the first time I did them for my sons Birthday party favors when he was 3 or 4 with crayons and a personalized CD (show you another time), and he will turn 7 in a few weeks. They have been used and abused but perfectly and have always been a hit. *Special Note: You will be seeing these again at Little Einstein's Mad Scientist Party this year, and why not all great Scientist need to take notes! On your computer turn your page settings to landscape, and set the page up for two columns. One column will end up being one pad and the other column (or side of paper) will be another. Center your text and clip art to the center of the column (page) and personalize for your guest, yourself, a friend, or whatever mood your in. Once you have printed out one for your master copy, you will then need to make copies (of your master sheet) to create your notepad ( I usually do between 25 to 50 sheets). You can use your computer printer, but if you can use a copier it's quicker. After all your copies are made, I then take mine to a local print shop where they will cut the pages in half to separate the notepads and then they will add a cardboard backing and bound the paper together creating your notepad. This usually cost under .50 cents each to do. Great RIGHT???? You can change the paper in the copy machine and make your notepads any color you like. 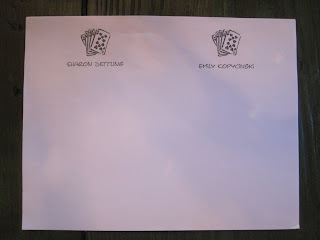 Plus, be creative your notepads can be a full sheet of paper, half or quarters, long or tall. It's endless, let me know what you come up with. These have been a great hit all the years I've used them, we've been to other children's party's (after Henry's) and even received them as party favors (what a compliment) and I now have friends who make them for themselves and my Mom is always asking me to whip her some up. Enjoy, email any photos of how your's turn out, I'd love to see them. Cute ideas! I love the note pads. That would be a great party favor also. I loved the little mason jars with flowers in them... I am also always doing party favors. I think people know they are going to get one, and so they are more motivated when I throw showers!! 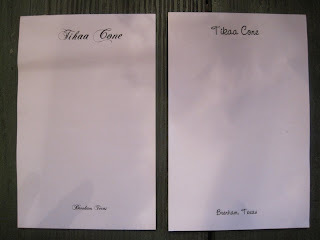 I have printed these for years, but I did not know that you could take them to get turned into a notepad. I always put the sheets in a basket. So which printer do you use? Also, Colton Loved the Christmas card from Henry!